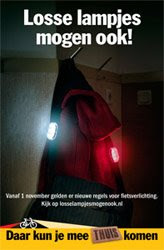 Thanks to John for sending us this link to a current Dutch campaign for bike lights. The Dutch do so many things right regarding promoting cycling positively. This campaign is no exception. The reason for the campaign is that the rules regarding bike lights changed on November 1, 2008. Previously, bike lights had to be fixed to the bike. The new rules allow for lights that are loosely attached to clothing. The poster above reads, "Loose lights are allowed, too." But it's not just a poster. Here's the website for the campaign. "Yes, loose lights are allowed, too. 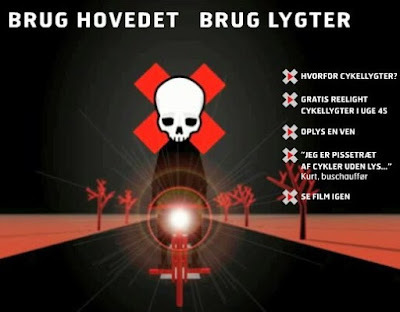 ...and don't forget to turn them off..."
This is a current campaign in Copenhagen, from the City's Traffic Council - Byens Trafikraad - for bike lights. It ran last year, too. A skull riding a bike in the traffic. Selling a Culture of Fear and wagging the irritating finger of a nanny state. What a massive contrast to the positive message from the Netherlands. It is worth mentioning that last year the campaign did include giving out free bike lights to people. The cool Reellights, but do we really need to see such posters on the streets? Children see them... what are we telling them? Obviously not the right things. We're sending right into the queue for car ownership.